The PowerCLI script takes a function and wraps around the vcenter and hostname prompts and connections. You are in a rush; on a system with no internet access; don’t want to figure out the parameters. 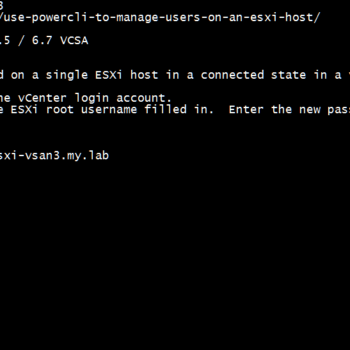 Use case – ESXi 6.x hosts is connected to a vCenter and your want to reset the root user password without host profiles. 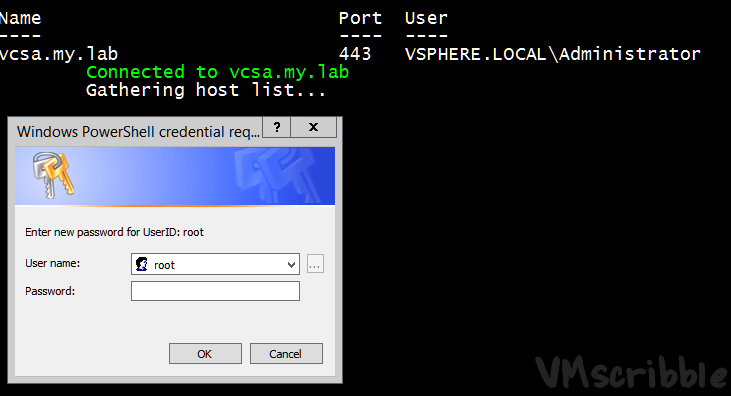 – The script will change the root password on a single ESXi host in a connected state in a vCenter. Password complexity applies! #1 – The first popup window will be for the vCenter login account. - The script will change the root password on a single ESXi host in a connected state in a vCenter. Password complexity applies! #1 - The first popup window will be for the vCenter login account. $thehost = Read-Host "Enter the ESXi hostname in $vCenter"
Set-ESXiAccount -Name "testuser" -Description "Local test User"
The name(s) of the vSphere Virtual Datacenter(s). $date = $date -replace ":", "-"
and what will be used. Write-Error -Message "You must specify a parameter (-VMhost, -Cluster, or -Datacenter)." Write-Error -Message "You must specify a Cmdlet parameter to update (-Description, -Permission, or -ResetPassword)." Write-Error -Message "You must be connected to a vSphere server before running this Cmdlet." Write-Warning -Message "`tDatacenter with name $vDCname was not found in $Global:DefaultViServers"
Write-Warning -Message "`tCluster with name $vClusterName was not found in $Global:DefaultViServers"
Write-Warning -Message "`tESXi host $invidualHost was not found in $Global:DefaultViServers"
$credentials = Get-Credential -UserName $Name -Message "Enter new password for UserID: $Name"
Write-Host "`tUpdating UserID: $Name on $vmhost..."
Write-Host $retry ": is the number of times a user is prompted for a new password if the password candidate is not sufficiently strong." Write-Host "N0 =" $pwd.Split(',') ": is the number of characters required for a password that uses characters from only one character class. For example, the password contains only lowercase letters." Write-Host "N1 =" $pwd.Split(',') ": is the number of characters required for a password that uses characters from two character classes." Write-Host "N2 =" $pwd.Split(',') ": is used for passphrases. ESXi requires three words for a passphrase. Each word in the passphrase must be 8-40 characters long." Write-Host "N3 =" $pwd.Split(',') ": is the number of characters required for a password that uses characters from three character classes." Write-Host "N4 =" $pwd.Split(',') ": is the number of characters required for a password that uses characters from all four character classes." Write-Host "`tUpdating Permission for UserID: $Name on $vmhost..."
Write-Warning -Message "`t$Name User ID does not exist $vmhost. Skipping host." Write-Warning -Message "`tCheck Connection State or Host name"